The Launch Pad: Just who follows us anyways? Just who follows us anyways? I conducted a brief and extraordinarily non-scientific experiment this afternoon by sending out a quick demographic poll via Twitter. The results were, perhaps, predictable, but nevertheless interesting. The most interesting piece of data is probably the gender gap, with nearly 3/4 of followers being male. Secondly, I find the lack of 65+ followers to be a bit disturbing, although given that the poll was sent out via Twitter, maybe I shouldn't be surprised. A couple more things to note: the sample size is very small, so this data may be meaningless; security is low, and does not prevent multiple votes (please don't purposely skew the data); anonymity was unclear on the original poll (I can assure you that it is 100% anonymous, the only data recorded are the two questions); there is no prequalifiers, so anybody (space geek or not) could vote. Interestingly, nearly three times as many people clicked through to the poll than completed it. The graphic above was captured after the poll had been open only two hours. It is still live, and you can feel free to fill it out below. I'll update later with the new data. Mike, I have to admit that I answered the poll twice.. but once for me and once for Ben. But, I know he didn't have time to answer and I figured I wanted both of us represented. I didn't skew numbers, I promise! That's interesting. We only have stats for our youtube videos which says that 60% are between 35-54, which I found surprising, and only 7% female. Of course, not very reliable data since it only counts people who are logged into youtube while watching the videos. Still, I was expecting the peak to be lower. 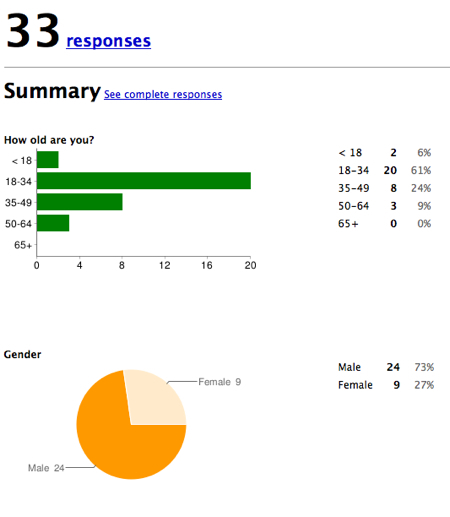 Alex: Our YouTube stats show something similar, about 18% female, ALL of whom are under 35. I tend to distrust most of the demographic data we gather from YouTube because, as you say, you must be logged in, but moreover it requires that people aren't lying, which I suspect many people are on a service like that.